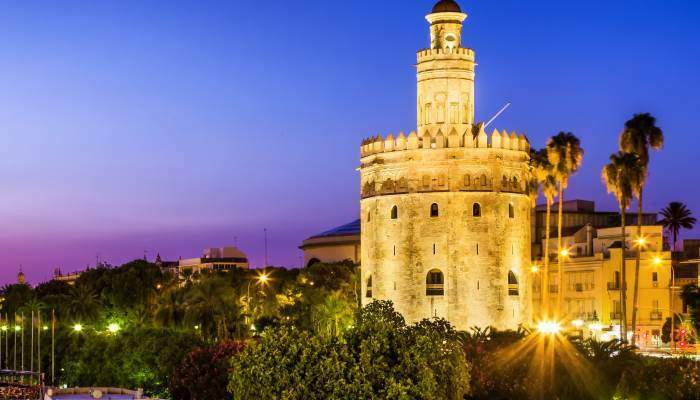 Seville‘s fiery, exuberant character is well-known worldwide, but what isn’t so obvious is the fact that it’s a pretty cheap city to visit. With churches and palaces, gardens and galleries all offering cheap entry, there are so many things you can do for less than £10. And you can also eat and drink here for a surprisingly modest amount. Have a look at what you can do and see in this atmospheric Andalucian city for next to nothing. 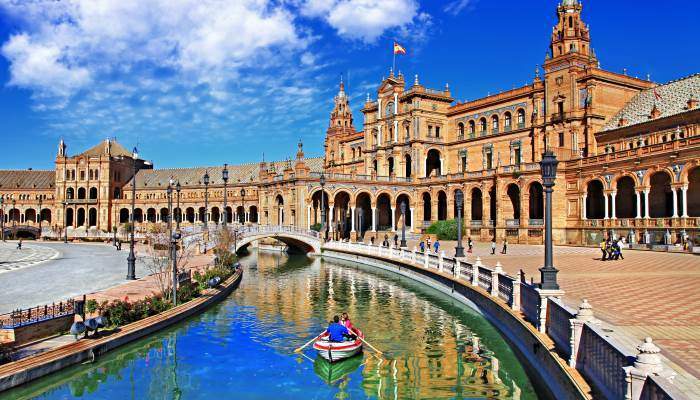 Moorish and Roman influences have helped mold Seville into the city it is today, with intricate places and cathedrals built in these eras proving to be great draws today. 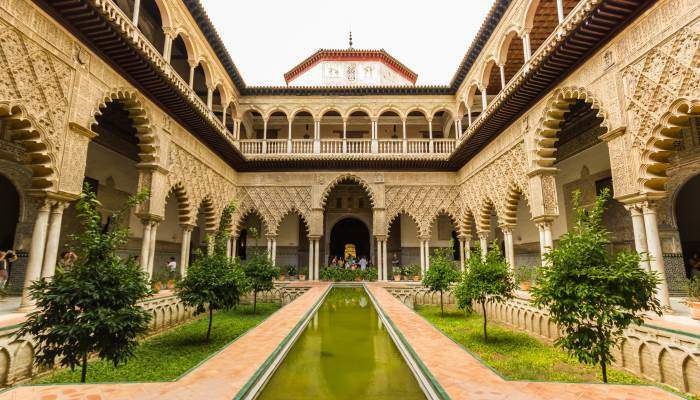 One of these is Real Alcazar, which flaunts its delicately carved arches and blooming gardens unapologetically. And so it should. Built as much for artistic as practical purposes, its attractive facade attracts countless visitors, and entry is free on Monday evenings from 6-9pm. 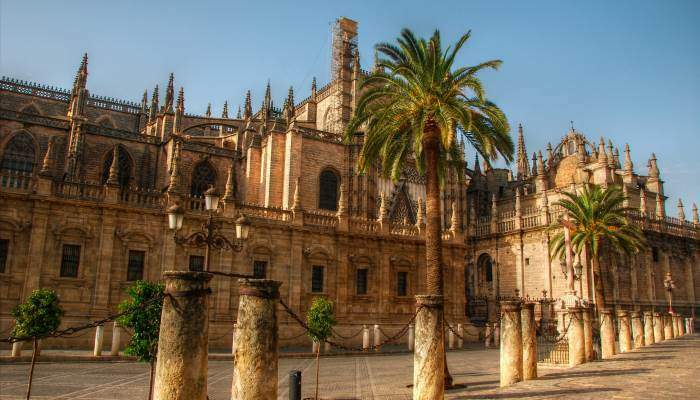 Also free on Monday evenings, Seville Cathedral is a stunning example of 15th century architecture. The clerics involved in developing it proclaimed: “We shall build such a large church that those who will see it finished will consider us crazy,” and its grand appearance puts it in strong contention for the title of the most beautiful church in Europe. The rest of the week it will cost you €9 to get in. Plaza de Espana lies within Parque de Maria Luisa and is one of the most popular attractions in the city. Here you can hire a rowboat and paddle your way around the semi-circular canal fronting the plaza. Costing just €5 for 45 minutes’ hire, it’s a leisurely way to view the it from different angles. 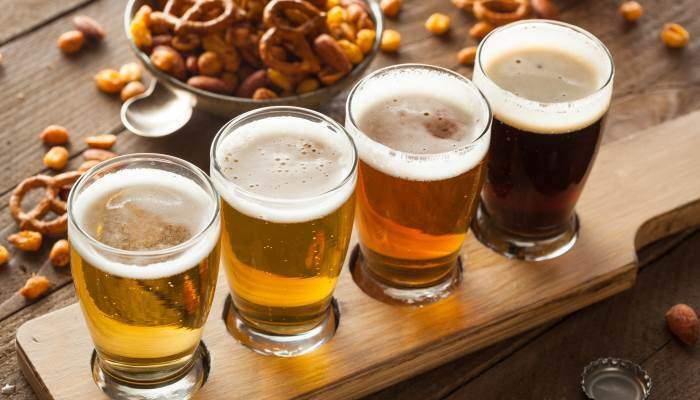 One of the coolest places to drink in Seville is Alameda de Hercules square which is 15 minutes from the Museum of Fine Arts. The square is made up of bars and restaurants and heaving with young Sevillanos who pull up on mopeds and congregate for cheap beers and tapas in the evenings. In Mercado Provenzal, you can grab una caña (a small draft beer) for a mere €0.40. That’s about 32p! Here, a glass of wine costs €1.20, a steep increase from beer but still a complete bargain! You can find free flamenco shows if you look hard enough but, more often than not, free entrance means you’ll have to buy a drink. 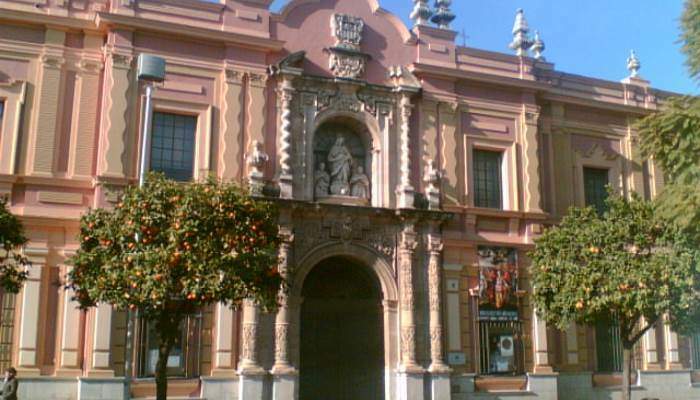 One of the more popular spots is the touristic La Carbonería, which hosts nightly flamenco performances. Then there’s Casa Anselma, named after the owner who’s known to spontaneously burst into song at throughout the night. The atmosphere here is much more authentic, but it gets busy so arrive early or expect a bit of a wait to get in. 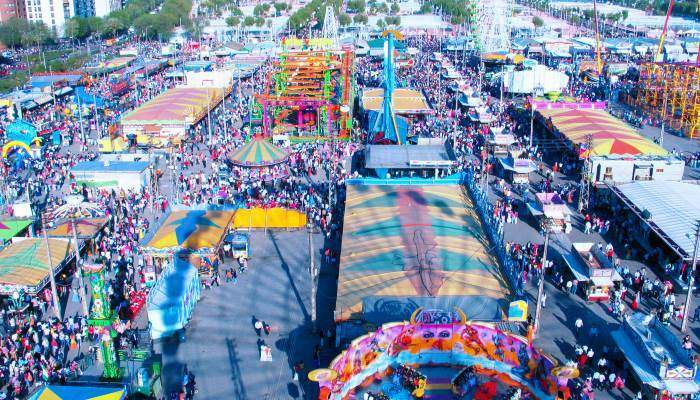 The highlight of Seville’s cultural calendar and one of the biggest and most exciting festivals in the country, Feria de Abril is a huge annual celebration that takes place two weeks after Easter. In the few weeks preceding it, you’ll know its coming because the streets will be littered with posters and decorations publicising the event, and when it does arrive, the city erupts with colourful street parties and around 1,000 striped tents set up camp for groups come together and party ’til the early hours. Hoarding centuries-worth of Sevillian artwork, the Museo de Bellas Artes is free to enter for EU citizens! For non EU citizens, it costs €1.50 for a ticket. Here, you can peruse several collections in 14 rooms with pieces from the Renaissance and Baroque periods, along with a whole host of others. 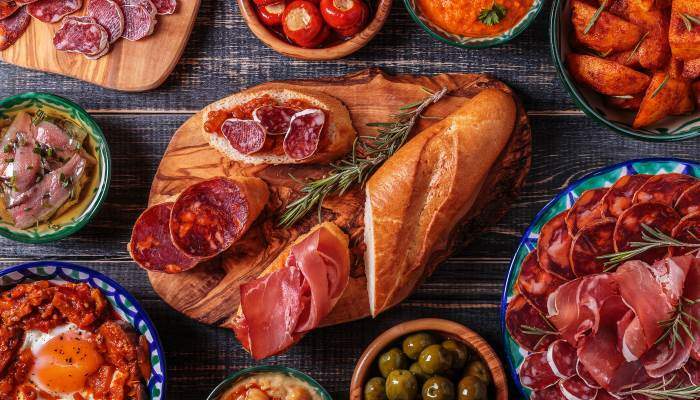 At many of the tapas restaurants in the city you can get small plates for around €2, meaning you can get about five plates for just under £10. One of these restaurants is Bodega Santa Cruz, which is close to the cathedral. 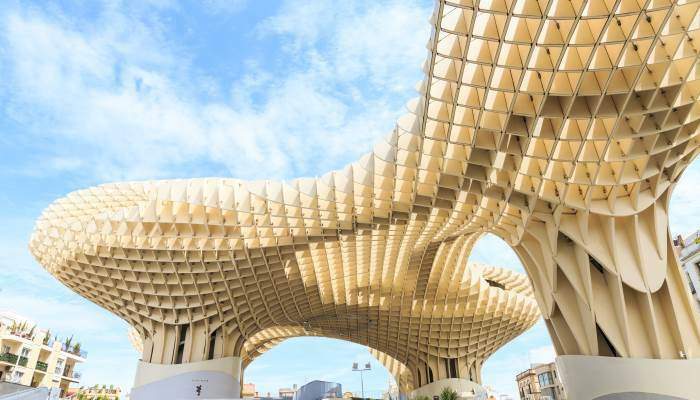 Getting a glimpse of the bizarre latticed mushroom-like covering located in the centre of Seville won’t cost you a penny. If you want to and walk along the top of it, though, you’ll have to cough up about €3. As well as gorgeous views of the city, you’ll get to boast to your friends back home about your adventures climbing Europe’s largest wooden structure (apparently). Built in the 13th century, the Torre del Oro watch tower is €3 to visit. Lying on the Guadalquivir river banks, it’s part of the fortified wall which used to border the city and it’s said that gold from Mexico was stored here during the colonisation of the Americas. ← Where are Malta’s Beaches?